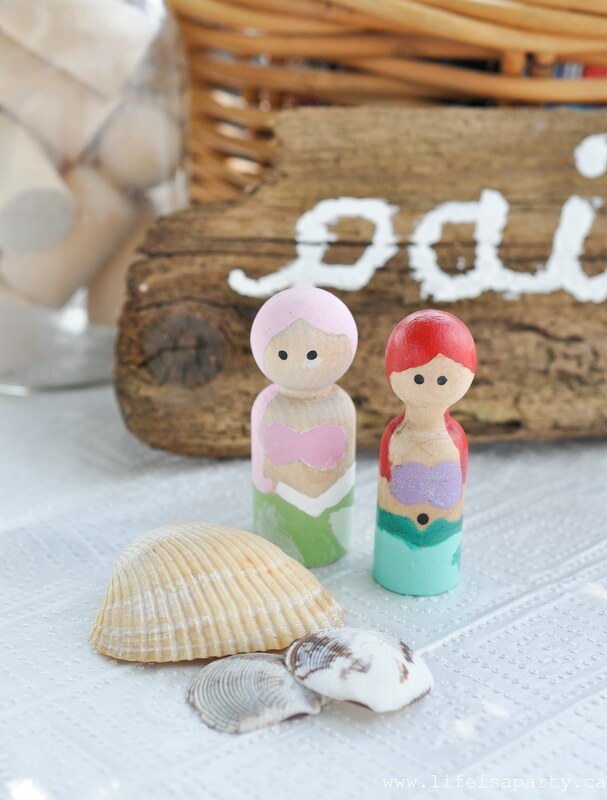 Mermaid Party Activities: great ideas for your mermaid themed party like dressing up, painting mermaid peg dolls, sand castles, a water fight, and a beach picnic. I’ve been saving this amazing Mermaid Party. We had the party at the end of summer last year. I didn’t want to share it as we headed into the fall. 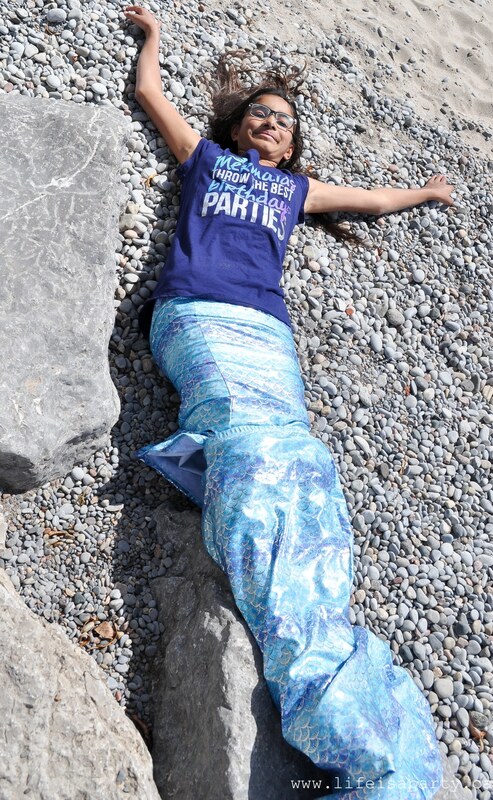 Now that the weather is so nice, I’m excited to share this with you and inspire you for all your mermaid parties this summer. My daughter loves to swim and so this beach themed party was absolutely perfect for her. It was so much fun planning it and even more fun at the actual party. 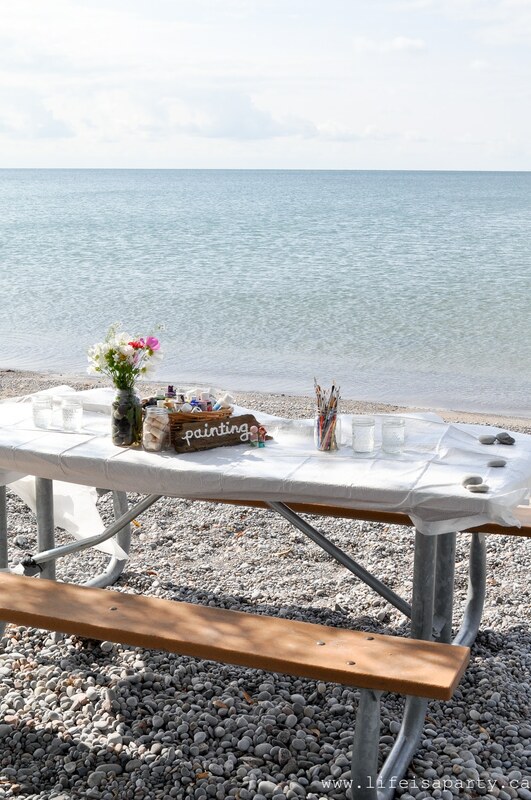 We live on the shores of lake Ontario, just outside of Toronto. We’re about a 10 min. drive away from our closet beach. 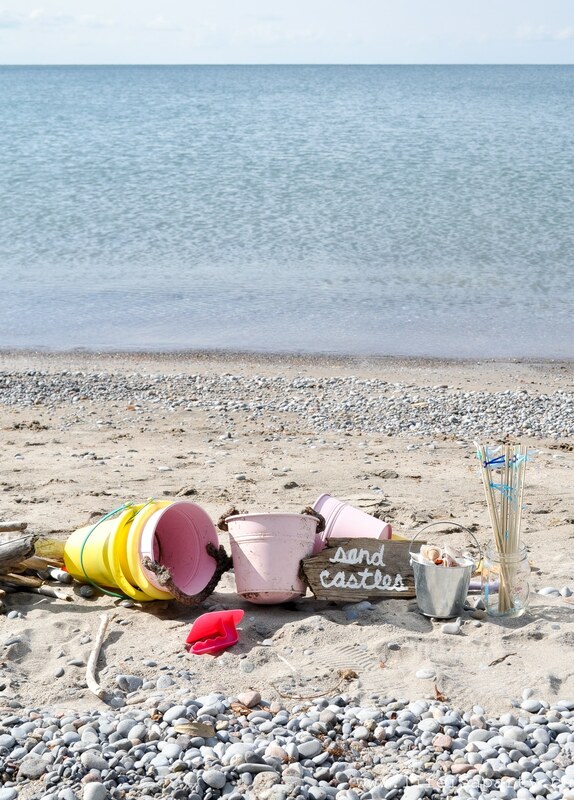 In the summer we love to go down to the beach for a walk or swim. 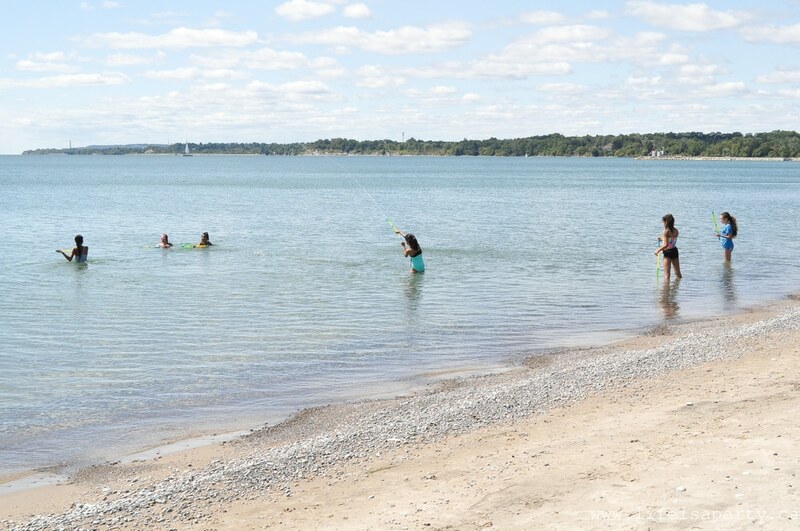 And summer holidays usually involve at least one beach day a week for me and my girls, since there’s so many nice lake side parks and beaches near us. 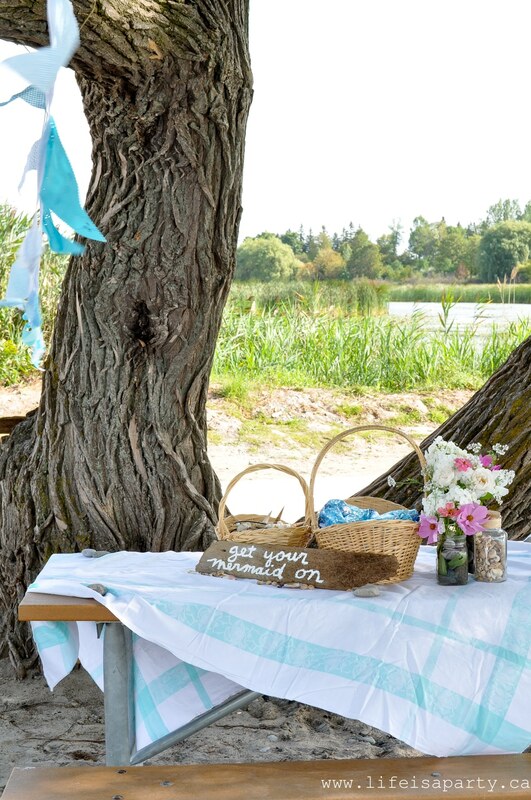 For this party we scouted out a perfect spot with a few picnic tables in the morning, and got everything all set up. 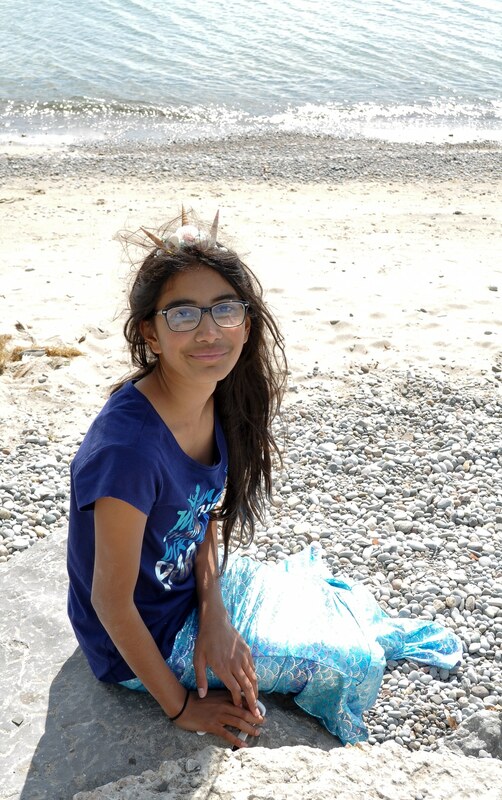 The girls came around 11, and we had a great time playing and enjoying a beach picnic lunch together. 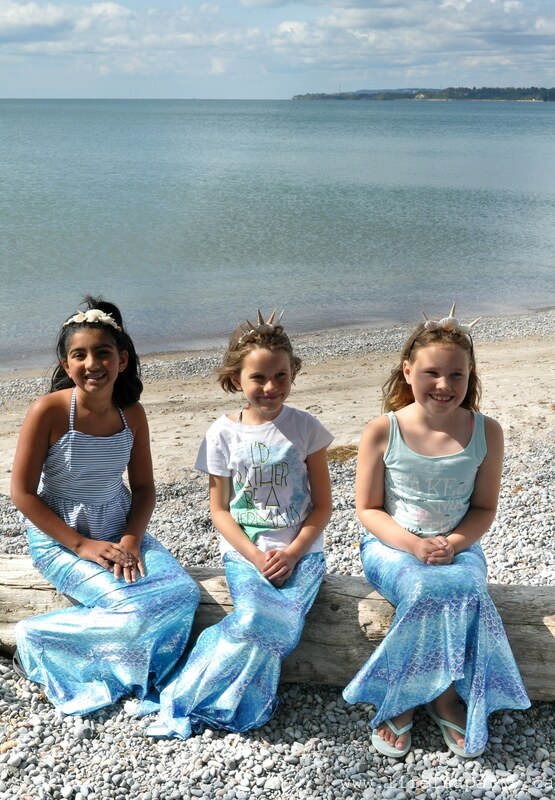 The colour scheme for the party was aqua, Paige’s favourite colour and the perfect colour for a mermaid party. 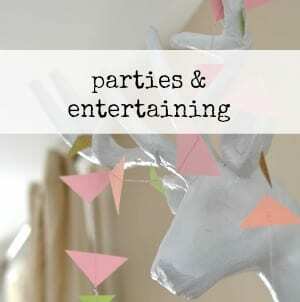 We hung up some bunting, and a lots of paper lanterns. 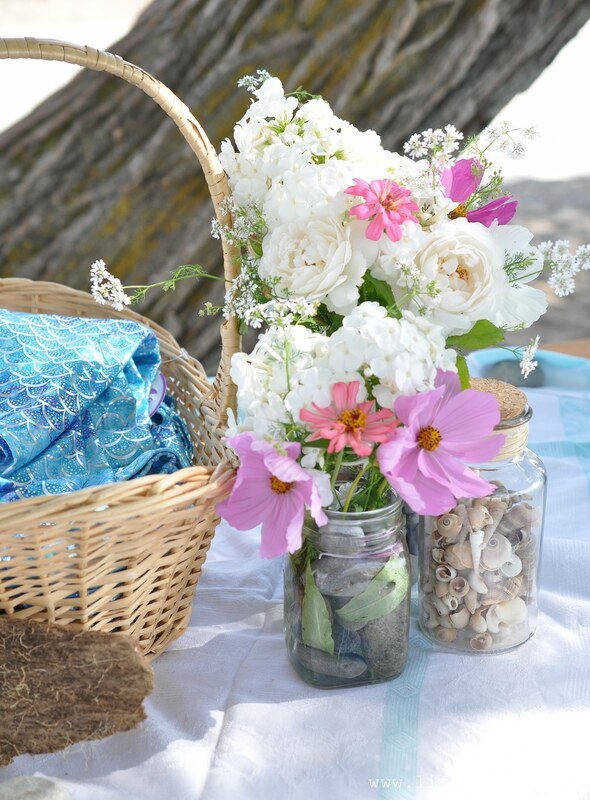 We added in some garden flowers and weighed down our vases with beach rocks so they won’t tip over in the breeze. 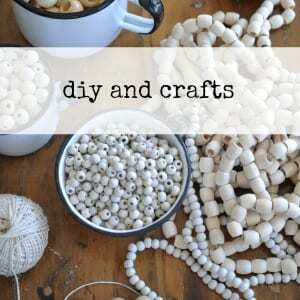 And we sprinkled shells all around too. We made some simple signs out of some old rustic boards. 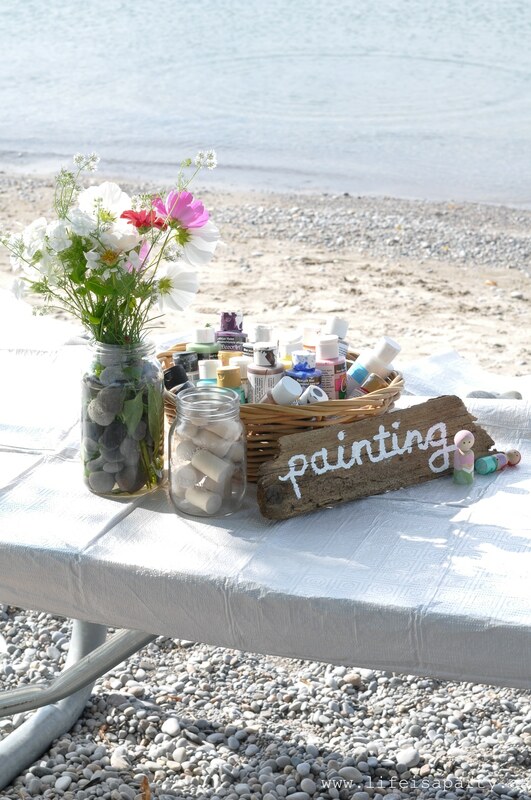 To make them, I wrote the words first in chalk and then with some white craft paint. 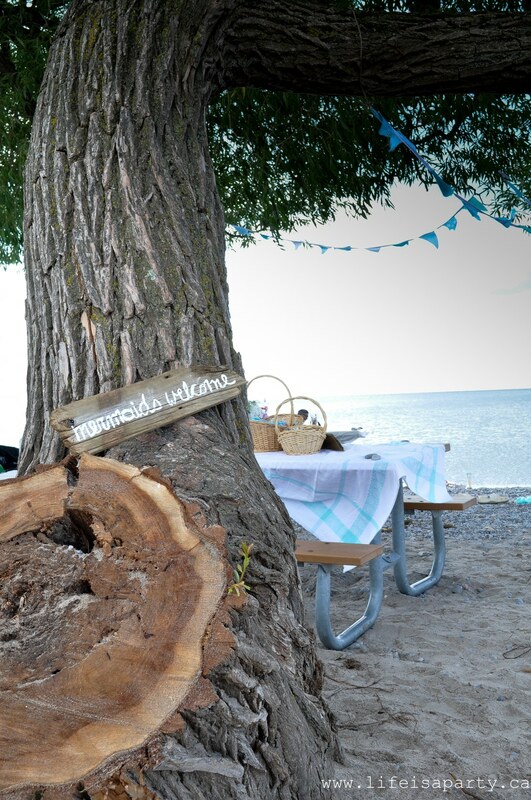 These rustic signs looked so beachy and added so much to the party. Here’s what we did at the party. 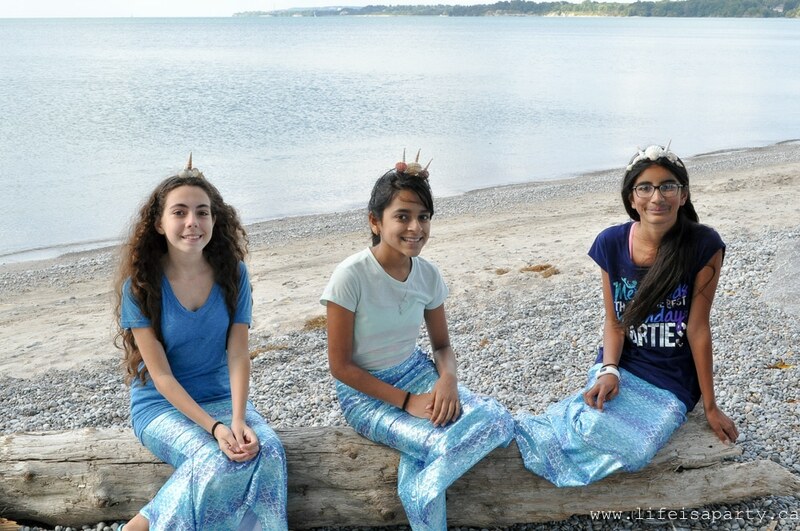 As our guests arrived, 7 girls total, including my two girls, they were invited to get their mermaid on. 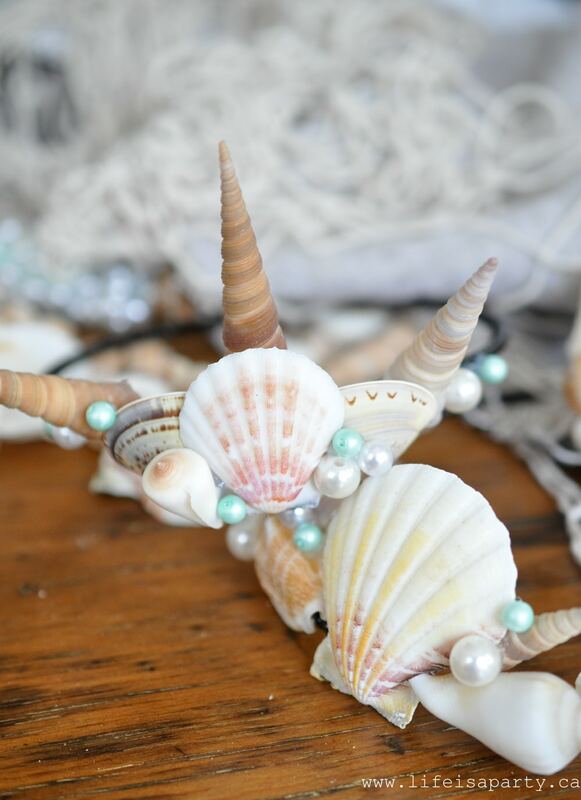 We made fun sea shell mermaid crowns before hand -I’ll share the simple tutorial later in the week. Everyone got to pick one to wear for the party and take home. We also had a mermaid tail beach cover up for everyone. I found these on sale at an outlet mall, and grabbed 7 of them. 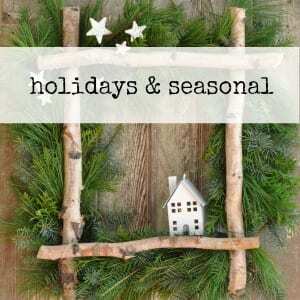 I thought they were absolutely perfect for the party, and fun take-home gift too. We did a few pictures with everyone looking like mermaids. Once everyone arrived and we did a few fun pictures of everyone in their mermaid outfits, we did a little painting. 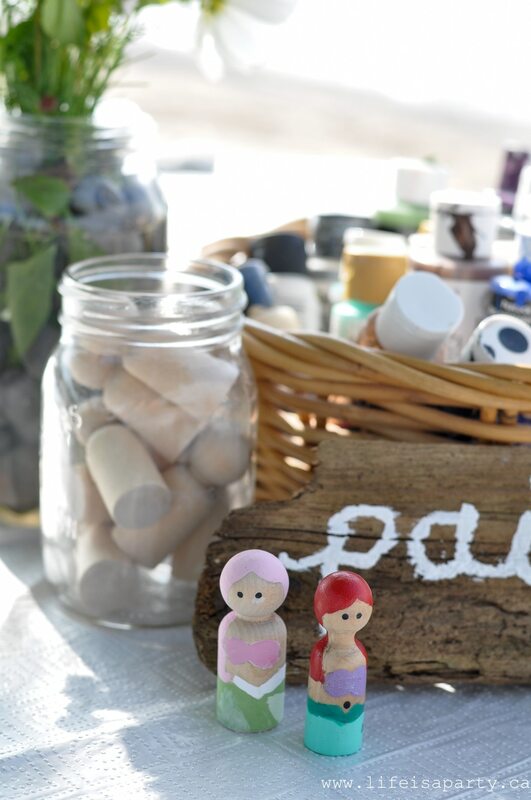 My girls love making peg dolls. They have made all different themed peg dolls, so for the mermaid party we thought it would be fun to create some mermaid ones. 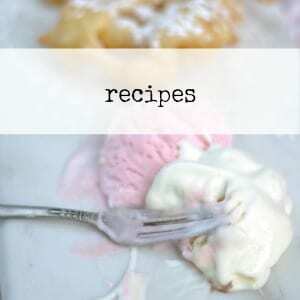 This was a great activity for a party with guests of different ages. My daughter and her school friends spent a long time painting theirs with lots of details and chatting away as they worked. The younger guests were done a bit more quickly and moved on to another activity. 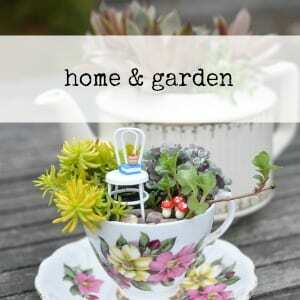 I love having lots of different activities where everyone can find something they love and play the afternoon away. 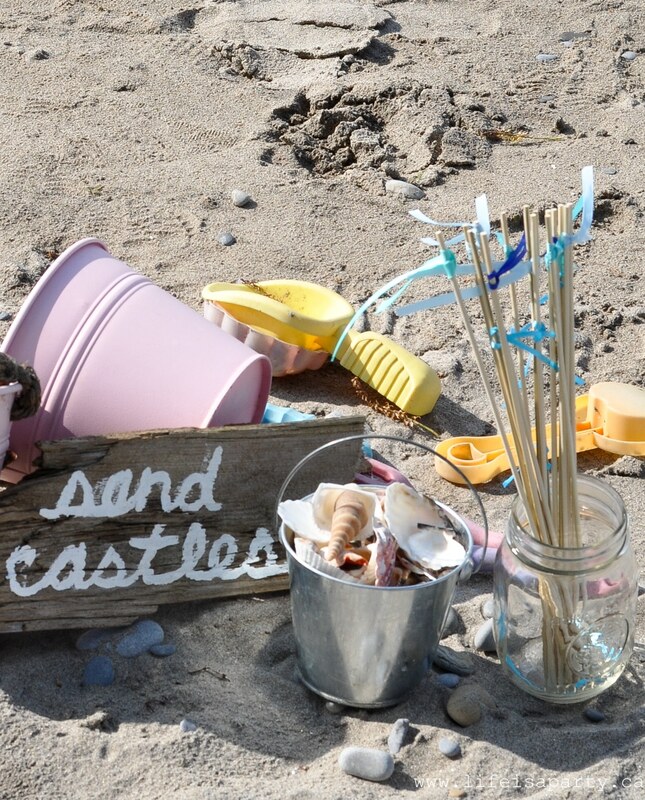 We thought it would be fun to have some sandcastle building. Sandcastle building is always a real favourite of my girls when we go to the beach. 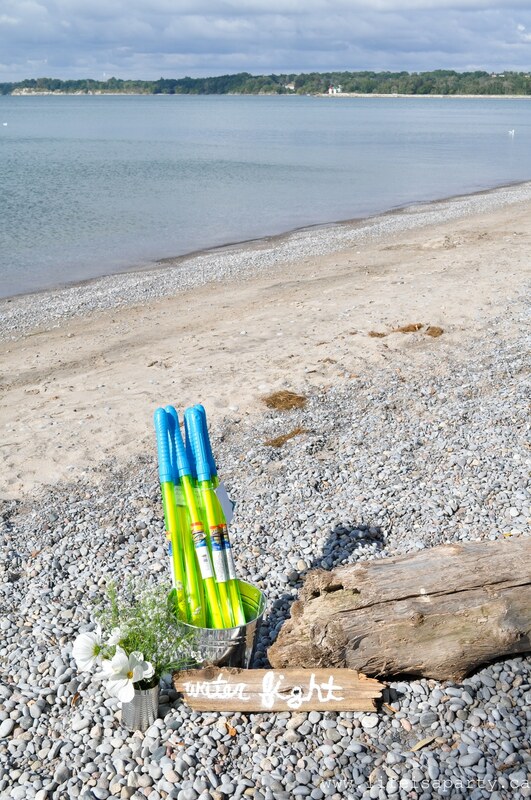 To make it a little more mermaid-y we had some shells on hand (there’s not to many shells in lakes, it’s not like an ocean beach where you could find your own) and some really pretty flags in our party colour – aqua. After lunch -which I’ll share tomorrow, it was time for a fun water fight! 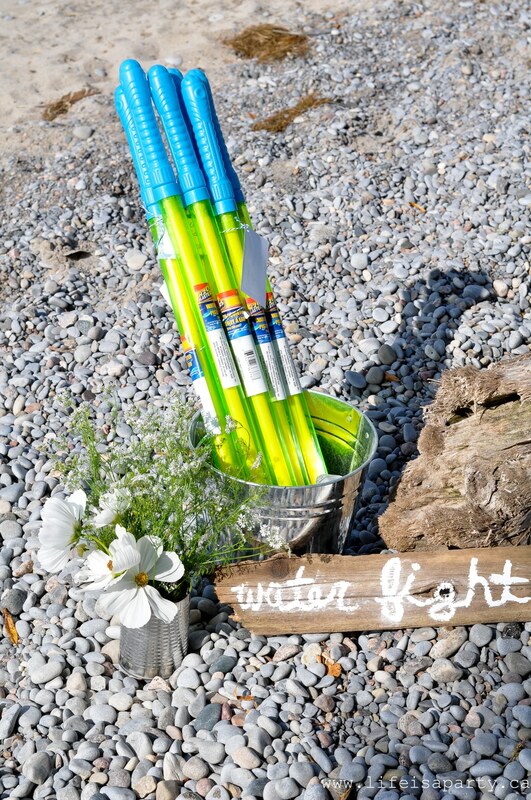 We bought some really fun water blasters from the dollar store that everyone could use for the party and take home after. The girls had a great time swimming splashing and squirting each other. We had such a fun afternoon together. It was the perfect way to spend a beachy day celebrating the birthday girl. 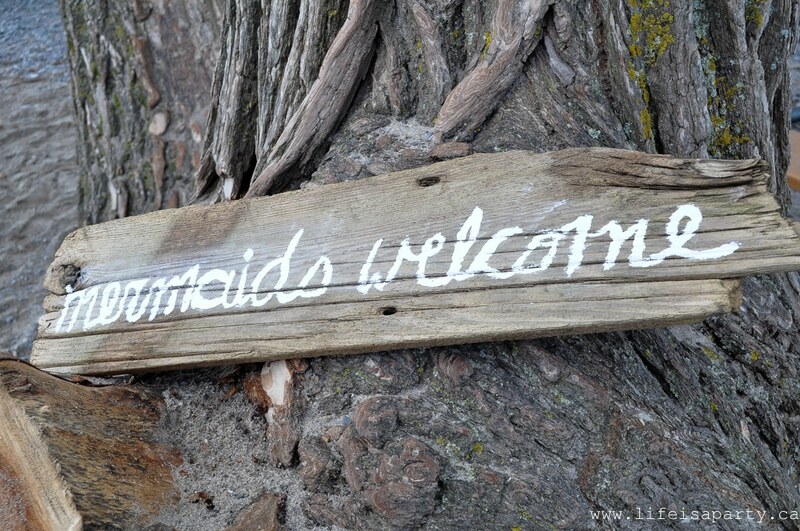 With a Mermaid Party, life really is a party! 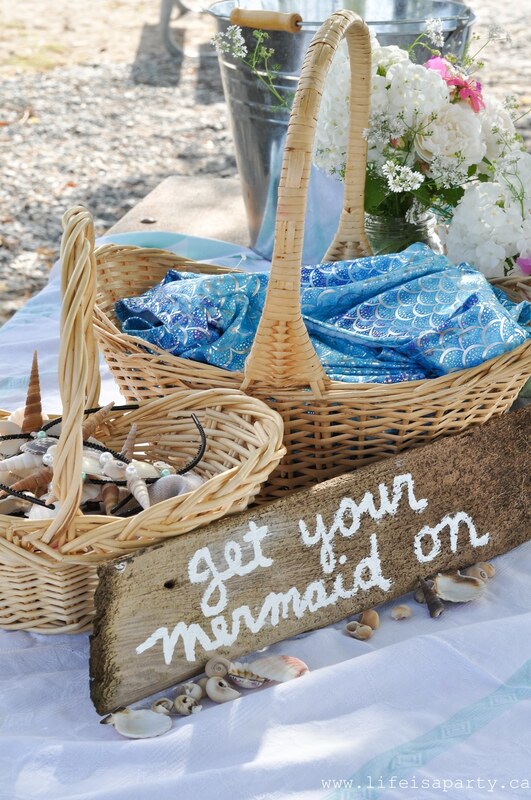 Tomorrow I’ll share with you are our amazing Mermaid picnic lunch and the Mermaid Dessert Table.